PSAT and SAT on Tuesday, April 9. Here are some of the topics/activities that we'll cover this week. Civics will be wrapping up the executive branch and starting the legislative branch. We will wrap up our unit on the Gilded Age and then move on the World Wars. We are preparing to end our unit on Asia. We are finishing our mini-unit on the weapons/technology of WWI and watching The Lost Battalion. We are finishing our chapter on civil rights and watching Hidden Figures. We'll be watching the documentary 13th as part of our unit on Social Control and Deviance. We will be waging war. Current Events is researching the Second Amendment. Civics will be finishing up their Constitution unit and testing next week. We are conducting a unit on the Civil War. We are in the middle of our unit on US geography. We will be testing on each region of the map before taking a test on all 50. We are in the middle of Chapter 12 on New Imperialism. This week we'll be looking at the British rule of India. We are quizzing on sections 1 and 2 of Chapter 16 on the Cold War. We will be testing on Chapter 16 next week. We will be getting in to the Persian Wars between the Greek city states and Persia with an emphasis on the battle of Marathon. Current Events is researching human trafficking. Congratulations, Mr. LeMond and Mrs. Adler! 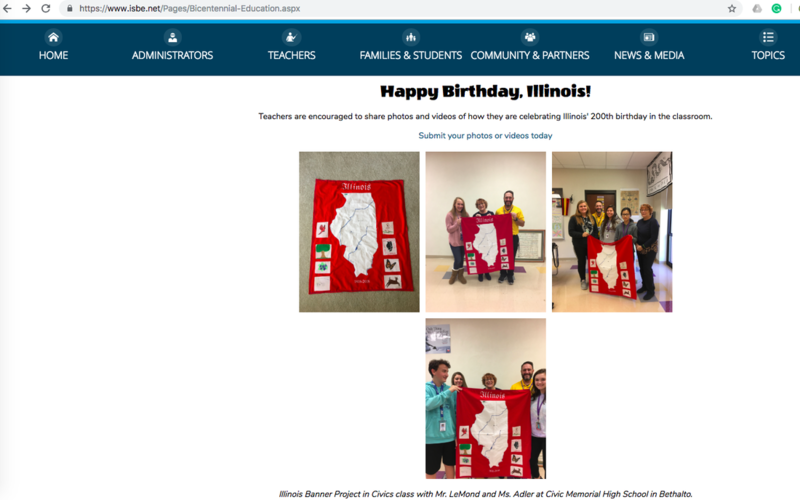 Mr. LeMond and Mrs. Adler's Civics class created this quilt as a way to celebrate Illinois' 200th birthday, and they were honored on the Illinois State Board of Education's Website! Civics will continue studying legislative branch. We'll be working on a Battle of Yorktown primary source. We are test on Unit 4 on Latin America. We will be test on Chapter 4 on absolute monarchs. We will start be finishing Chapter 12 on the Great Depression. Current Events is still working on American Gun Culture, Gun Violence, and the Second Amendment. Civics will begin a new unit on the legislative branch. We'll be testing on our unit on the American Revolution. We are beginning chapter nine on the cultural geography of Latin America. We will be wrapping up Chapter 4 on absolute monarchs. We will start and finish Chapter 12 on the Great Depression. We're testing over the Executive Branch. We'll be beginning our unit on the American Revolution. We are beginning our unit on Latin America. We will be beginning Chapter 4, on the Age of Absolutism. We will be finishing Chapter 11 on the Roaring Twenties. We'll be spending the week working out of the book on Chapter 6 on Groups. We'll be wrapping up our unit on the IL Constitution. Testing on Friday, 10/26. This test is a graduation requirement. Students must score a 70% or better. We are continuing our unit on the physical and cultural geography of the US & Canada. We will be going through Chapter 3, Sections 2 (Spanish/Portuguese rule of New World) & 4 (Atlantic Slave Trade). We will be wrapping up Chapter 10 on WWI. We will be finishing Chapter 4 on socialization and will begin Chapter 5 on Social Structures. We will be testing on this unit in early November. On October 10, we'll be taking the state-required US Constitution test. We will be spending our class time preparing for this test. We will begin Unit 3 on the US and Canada. We will be finishing our lesson on the Reformation and will begin Section 4, on the application of the Reformation in England. We'll conclude Chapter 9 and begin Chapter 10, on WWI. Next week, we'll begin Chapter 3 on culture. With this chapter, we'll begin to do more readings and class discussions. This week we'll be focusing Alexander the Great. Our topic for research and discussion this week is human trafficking. We will be wrapping up Chapter 4 and taking the test. We'll be continuing Chapter 9 on the Progressive Presidents. We'll be studying the ancient Greeks, with a focus on Sparta. Our Free Speech/Kaepernick assignment is due. Then, we'll begin our discussion of the problem of recycling lithium ion batteries.